The oft-parroted sound bite – "we need herd immunity"- implies that if ninety five percent of the population can become "immune" to a disease via vaccination, target immunity levels will be met and diseases will either be eradicated or controlled. This sound bite is the most commonly pulled weapon used by the vaccinators, only second to "smallpox and polio were eradicated by vaccination." "Herd immunity" is the trump card for the defense of vaccination on TV, Internet, medical journals and newspapers as to why we should be vaccinated over and over throughout our lives, with an ever-increasing number of vaccines. Paul Offit smiled and PLAYED THE CARD while peddling his book on the comedy central channel as Steven Colbert jokingly said, "if the vaccines work so good for you, why do I need one?" Dr. Mark Segal PULLED IT on fox news as Mary Holland, JD eloquently described the issue of vaccine injury and loss of legal recourse in an era of forced and mandated vaccines. In addition to flaunting several false allegations and sound bites, Dr. Segal's well-rehearsed rant brushed right over the issue at hand, the fact that victims of vaccine injury have no legal right to sue – and instead launched into his agenda of scaring the listeners by parroting the "herd immunity" dogma. The hype about herd immunity unfortunately creates a wall of hostility between those who vaccinate and those who delay some vaccines, avoid certain vaccines, or quit vaccinating altogether. Since the beginning of vaccination, there is little proof that vaccines are responsible for eradicating disease even when herd immunity vaccination levels have been reached. Yet celebrity doctors rattle on about your unvaccinated neighbor being the biggest threat to your child – as if vaccination was the only way to avoid an illness or stay healthy. To make matters worse, this intimidation to vaccinate is played out in an environment where WHO and vaccine manufacturers have been accused of scandalous misrepresentations of disease risk or vaccine safety and effectiveness. If the allegations against these entities are true, which I believe they are, we are being systematically altered, sickened and manipulated by powerful governing bodies that either don't understand the risks of vaccination, or don't care. We are told that the health of the herd is more important than any single life, and you now have no conventional legal recourse when your little sheep is wounded by any type of vaccine, no matter how it happened. The population of the world is expanding over the past 200 years where vaccines have been used, and this makes obtaining herd immunity even more expensive and impossible today than ever. How many billions of people would need to be vaccinated how many times to eradicate just one illness based on the theory of vaccine herd immunity? How much would that cost? Consider the cost of vaccines, refrigeration, vaccinators, and hazardous waste removal. Just look at chicken pox vaccine at $7.25 per dose for the CDC discounted price. Each child gets 2 doses. "Prior to the universal varicella vaccination program, 95% of adults experienced natural chickenpox (usually as school aged children)—these cases were usually benign and resulted in long term immunity. This high percentage of individuals having long term immunity has been compromised by mass vaccination of children which provides at best 70 to 90% immunity that is temporary and of unknown duration—shifting chickenpox to a more vulnerable adult population where chickenpox carries 20 times more risk of death and 15 times more risk of hospitalization compared to children. Add to this the adverse effects of both the chickenpox and shingles vaccines as well as the potential for increased risk of shingles for an estimated 30 to 50 years among adults. The Universal Varicella (Chickenpox) Vaccination Program now requires booster vaccines; however, these are less effective than the natural immunity that existed in communities prior to licensure of the varicella vaccine." In India, doctors are concerned about profit margins being protected before human lives, with recommendations to vaccinate every child with more expensive, newer vaccines. Dr Jacob Puliyel describes the problems he sees..
"An analysis in the Lancet showed how the Pneumococcal vaccine reduces only 4 cases of pneumonia per 1000 children. The cost for vaccinating 1000 children comes to $ 12,750. Treating the 4 cases of pneumonia in India using WHO protocol, would cost $ 1. The pneumococcus strains prevalent in India are nearly all sensitive to inexpensive antibiotics like penicillin. In the US which has been using the pneumococcal vaccine for some years now, there has been a strain shift – strains covered in the vaccine are being replaced by other strains. Ominously the new strains are more antibiotic resistant. Vaccine has simply made the problem of pneumococcal disease worse. Yet this vaccine is being pushed in Africa and Asia....It is not about lives lost in poor countries – it is all about the cash register. These organizations and their sponsors have profit margins to protect. Ethics is not a major issue with them." The profits to vaccine manufacturers and the government must be enormous. The CDC is in the vaccine business. Members of the CDC's Vaccine Advisory Committee accept payment from vaccine manufacturers. Sanofi-Pasteur, Merck and others specifically seek to employ CDC staff once their contracts have run out. Relationships have included sharing a vaccine patent, owning stock in a vaccine company, payments for research, payment to monitor manufacturer vaccine tests, and funding academic departments. Thanks to a 1980 law, the CDC currently holds dozens of licensing agreements. It also has numerous ongoing projects to collaborate on new vaccines. What science is there behind the belief that the herd can be protected by vaccinating enough of the sheep? Or that any disease has been eradicated from the planet thanks to a vaccine? Recently, I was told by a vaccinator that "herd immunity is just a definition and so it can't actually be wrong. " But the assumption of a 95% vaccination rate giving the herd a chance at eradication or higher levels of health – can be wrong. Let us go back in time and see just where the idea behind this definition probably comes from. Dr A.W. Hedrich in 1929, studied the natural occurrence of measles. Before vaccines, outbreaks of measles were observed in 2 to 3 year cycles, and 95% of the population developed immunity by the age of fifteen. The original idea that vaccination could strengthen the herd's immunity, assumed that there was only one clinical event, and that one natural exposure equated life-long immunity. But this was not the case back when the diseases circulated freely. Vaccinators miss the point that the body defends most efficiently as a result of ongoing re-exposure. They try to mimic this with boosters. But the vaccination plan leaves the elderly(due to vaccine-induced immunity being short-lived and antigens taken out of circulation) and the very young(due to lack of transferrable maternal immunity) more vulnerable to several diseases that were not a threat to them before vaccination. In the case of chicken pox, vaccination renders the elderly more apt to shingles infections, because the herd has now lost the continued and benign re-exposures to children with chicken pox. Instead of figuring out why a very small number develop dangerous invasive conditions, vaccine enthusiasts recommend vaccinating as often as possible in order to protect against something that would never be a danger to the vast majority of those vaccinated. If you constantly swab throats of healthy people most would be carrying and circulating supposed pathogens, as commensals. At any one time in any society, neisseriae(the bacteria isolated in some cases of meningitis) are being circulated, yet most of the time, nothing happens, other than the body notes it, defends against it, and the host has no idea that they even carried it. But now that vaccines for as many types as possible have been developed, the vaccine is the answer to the problem. This is typical for diseases today. It is well documented that prior to vaccination, cycles of natural infection added to the herd's immunity. "The formal demonstration that both maternal antibodies and early exposure to infection are required for long-term protection illustrated that constant re-infection cycles have an essential role in building a stable herd immunity. Vaccination creates a "quasi-sterile" environment that opens up the possibility of disease outbreaks. We know this is possible because there have been eruptions of measles in the USA in populations that were 100 percent vaccinated. Within the scope of vaccination, when a quasi-sterile situation is created, and measles breaks out in the midst, the only solution within that paradigm is to vaccinate more people, more often. This is a backwards solution to the problem when considering who remains susceptible even in the face of full compliance: infants and non-immune adults. Susceptible age groups have essentially traded places since vaccinating. What used to happen with measles is that infants were protected by maternal antibodies, adults were protected by continued exposure, and infected children handled the disease normally and became immune for long periods of time. So, while measles vaccines have decreased the expression of measles infections, it has not necessarily improved the bigger picture. And certainly there are numerous troubles with the side effects of the vaccine. Since most vaccines are delivered by injection, the mucous membranes are bypassed and thus blood antibodies are produced but not mucosal antibodies. Mucosal exposure is what contributes to the production of antibodies in the mammary gland. A child's exposure to the virus while being breastfed by a naturally immune mother would lead to an asymptomatic infection that results in long-term immunity to that virus. Vaccinated mothers have lower levels of virus-specific antibodies in the serum and milk compared to naturally immune mothers and thus their infants are unprotected. For the disease of measles, we see that while the clinical case rate may have declined with vaccination, the most sensitive members of the herd are at an increased risk- as a result of vaccination. Dr Peter Aaby has produced volumes of research on measles in Africa. Initially there was a belief that measles infection was associated with immune suppression and higher long-term mortality, but that belief came from vaccine research, not natural measles research. Measles is mildest when the infected person is replete with vitamins C and A. The devastation and mortality you hear about with measles comes from starving populations. The vaccine was created because it could be done, not because we needed it. Measles is not eradicated. Outbreaks happen all over the world, and will continue. And now infants will be unprotected because of the absence of maternal antibodies in their vaccinated mother's milk. So much for protecting the most vulnerable in the herd. Orthopox is a member of the family of Poxviridae. The ancestor of the poxviruses is not known but structural studies suggest it may have been an adenovirus or a species related to both the poxviruses and the adenoviruses. Orthopox viruses include cowpox(vaccinia), smallpox(variola), and monkeypox. Mutations do occur in these viruses, but at a very slow rate. Between October 1970 and May 1971 a poxvirus was isolated from some symptomatic patients in West Africa. That virus is now known as "human monkeypox." Monkeypox got its name because monkeys were the first animals known to have harbored the monkeypox virus. Scientists now say that the primary reservoirs for monkeypox virus are not monkeys but probably squirrels. WHO officials in 1976 had no idea what the true reservoir of infection was. Today, according to CDC, it remains uncertain. Smallpox was declared eradicated worldwide by the World Health Assembly on May 8,th 1980. Vaccination was stopped in the USA in 1972. However, poxviruses that were indistinguishable from smallpox continued to cause human disease. Monkeys in surrounding areas where monkeypox outbreaks occur usually test negative for monkeypox. But prairie dogs, exotic rodents, Gambian rats, dormice, rope squirrels and other animals have tested positive. Nobody really knows when or where monkeypox viruses originated, but they seem to be close relatives of cowpox and smallpox. All three viruses have rodent reservoirs, which is important when considering the history and current transmission of smallpox and monkeypox. Today, monkeypox outbreaks are blamed on rodents or exotic pet imports, not person-to -person transmission even though human transmission does occur. Historically, smallpox reservoirs were also rodents – during a time when rodents were eaten as food and when infestations were commonplace. Yet in the discussion of smallpox outbreaks this is rarely mentioned. What we hear is how the vaccine eradicated the disease. THIS ARTICLE states that monkeypox was first recorded in 1970 after the eradication of smallpox in the Democratic Republic of Congo. University of California, School of Public Health epidemiologist Dr Anne Rimoin states that monkeypox first arrived in humans after smallpox eradication, even though it has been on the earth for millennia. "Monkeypox has probably occurred for millennia in central Africa, but it's only since the eradication of smallpox that it's been a disease that actually happens in humans," Rimoin says. " There is absolutely zero certainty as to when monkeypox first colonized humans. It is more accurate to say that monkeypox was first detected in humans around the time that smallpox was being declared eradicated, not that it arrived in humans at that time. Differentiation tests were not carried out on most cases of pox in the past 200 years. Laboratory diagnostic assays for monkeypox include virus isolation and electron microscopy, ELISA, immunofluorescent antibody assay, histopathologic analysis, and Polymerase Chain Reaction (PCR). Unfortunately, most of these methods are relatively nonspecific and are unable to differentiate monkeypox viral infection from infection with other poxviruses. All but PCR are fraught with false positives, false negatives, and cross reactivity. In the 1970s and 1980s, biochemical tests were unreliable in differentiating between monkeypox and smallpox. Animal challenge tests were historically used to determine the difference between monkeypox and smallpox. The technique involved inoculating rabbits and watching the characteristics of the pox. Initially the two kinds of pox appear similar in the rabbit, but after a few days, monkeypox distinguishes itself as it becomes hemorrhagic. LINK TO DOC HERE. The problem with such means for distinction is that there has always been a hemorrhagic form of smallpox. ELISA is not much of a gold standard test as it casts a very wide net, and is fraught with false positive and false negative results. ELISA TUTORIAL HERE. The genomes of these three orthopox viruses are extremely conserved and require a technology that can detect the minute differences. Polymerase Chain Reaction (PCR) is a newer test that came on the scene in the 1980s. This test is different in that it can potentially find pieces of DNA from a virus. The genetic sequence of a virus has to first be mapped prior to designing a PCR test. So before smallpox, cowpox, or monkeypox viruses were characterized genetically, PCR could not be applied to distinguish between them. The first PCR test for monkeypox was used in 1997, but highly sensitive real-time PCR was not in use until 2006. Different biotech companies have developed different tests that use different primers. PCR, while highly sensitive and specific at about 98%, still has drawbacks, contamination being the biggest one. No test is foolproof. Nonetheless it is probably the best assay available for detection and distinction today. It should now be obvious that during the two centuries of smallpox vaccination and up until the 1990s there was no certain way of testing for distinct orthopox viruses. During the two centuries of vaccination, the viruses were likely to mutate, and certain strains could have been selected out as a result of vaccination. Therefore, does anyone know how much 'smallpox' disease was actually monkeypox or vaccinia? Given that monkeypox is thought to be an ancient virus, where was it during the smallpox epidemics? Was it called hemorrhagic smallpox? ACCORDING TO SCIENTIFIC AMERICAN, monkeypox is not that rare. Seven hundred and sixty cases of monkeypox were counted in the Congo between 2006 and 2007. Before and during the time of eradication declaration, PCR was unavailable, and the different poxviruses couldn't be distinguished by their DNA, but by a skin test on rabbits, chick embryo membranes, and blood tests that were fraught with uncertainty. It seems to me that what was once called smallpox was likely a very non-uniform disease that could have been anything from cowpox to two forms of smallpox to chickenpox to monkeypox. When vaccination stopped, monkeypox was suddenly diagnosed in humans. Diagnostic methods were absent during the great vaccine campaigns and everything pox-like was considered smallpox and counted as smallpox. Differentiating was not a priority. "Because the monkeypox virus is related to the virus that causes smallpox, the smallpox vaccine can protect people from getting monkeypox as well as smallpox. Even though PCR can distinguish between the three viruses, clinically and immunologically the viruses are so similar, that one virus in the vaccine is thought to immunize against the two other viruses. During outbreaks they all look the same. After the world trade center collapses in New York there were concerns over potential bioterrorism. Forty thousand health care workers and first responders and 450 thousand military were vaccinated in 2003. They were all contagious for the nineteen-day post-vaccine shedding period. Some doctors were asked to receive the vaccine in order to care for those who took the vaccine and developed vaccinia, or to care for those who became infected upon contact with a recently vaccinated person. Multi-state outbreaks of monkeypox were reported in the same year. Most cases are presumed to have come from contact with prairie dogs exposed to rodents per CDC. However all cases were not exposed to animals. ACCORDING TO A 2005 REPORT, of 72 cases only 37 cases were laboratory confirmed. Eleven original cases were thrown out of the database when they met exclusion criteria.EXCLUSION CRITERIA. There is mention of human to human infection, though in some reports this is denied. This is a very strange coincidence; vaccination and concomitant pox outbreaks in the same year. Supposedly, monkeypox is not easily transmissible between humans, but there is a report in the literature of a 5 chain human-to -human transmission, and human-to-human monkeypox transmission is well documented. A NEW ENGLAND JOURNAL OF MEDICINE REPORT vaguely stated that"There was 'limited or no' spread of monkeypox virus through human contact during this outbreak." In 2003, the year that half a million people were vaccinated in the USA – AND the only year of monkeypox outbreaks in the USA, a multistate (Illinois, Indiana, Kansas, Missouri, Ohio, and Wisconsin) outbreak, was the source of the outbreak definitely prairie dogs? CDC doesn't state how many pox cases were exposed to prairie dogs, just "the majority of them had direct or close contact." The vagueness of CDC's reports gives rise to doubts. Only 37 of 72 cases were confirmed with PCR tests, and eleven of the original total were excluded from analysis. Excluding numerous cases on frivolous grounds is one way to dampen a negative outcome after a vaccine accident. Without discontinuing vaccination, it would have been impossible to stop the flow of smallpox. Doesn't that lead you to wonder how much smallpox was the result of the vaccine rather than natural smallpox? We know that in places like Leicester UK, when vaccination ceased, so did smallpox. And there are numerous accounts of smallpox disease not only being much more severe and deadly among vaccinated populations, but also more prevalent. Isn't it interesting that smallpox vaccine defies everything we know about specificity in immunity and that one vaccine covers all sorts of pox, except chicken pox? Can you imagine, nowadays, if a vaccine researcher suggested that an illness could be prevented by using a slightly related virus? Today's vaccines contain numerous strains and types of the same organism. Polio vaccine has 3 types of poliovirus, influenza 2 strains of type A and one strain of type B. But smallpox vaccine today contains one of many possible strains of a related virus, not even the smallpox(variola) virus at all. In Jenner's time, it is anyone's guess which viruses ended up in the vaccines since the technique was so primitive and typing methods were not available. Still, these vaccinia vaccines are thought to have eradicated smallpox, and serve as the foundation for vaccine faith. Scientists back in the 1800s and early to mid 1900s had no way to differentiate smallpox, cowpox, monkeypox or most other pox diseases in humans. Nor was there any effort to differentiate, until the disease was declared eradicated – just like when polio was eradicated. Anything that looked like polio, but not caused by a polio virus, was called acute flaccid paralysis. You probably can't tell the difference between the two diseases, and neither can most doctors. Edward Jenner and the doctors of the 1800s and 1900s were also unable to distinguish smallpox – major and minor, monkeypox, or cowpox, or even chickenpox. "When [monkeypox] infection in human beings does occur, it can be clinically indistinguishable from smallpox, chickenpox, and other causes of a vesiculopustular rash." It is now known that many cases of smallpox were mild. These are termed variola minor. Variola major and variola minor are indistinguishable using the sensitive PCR test, and thus represent the same infectious organism. Do you think your doctor would know a case of variola minor if he/she saw it? Or would it just be called chicken pox? Do you think your doctor would even think that it could be smallpox, given that smallpox is thought to be eradicated? There are clinical means to distinguish the difference, but few doctors think of it, and in the minor forms of smallpox it wouldn't matter anyway. Many believe that smallpox was eradicated from the planet because of vaccination. I once believed this idea that was taught to me in medical school, and that all conventional doctors parrot as if they understood the history. With just a little research it becomes evident that even though smallpox seems to have disappeared, this was not the result of mass vaccination. It is obvious that the vaccines of 1796-1900s were not purified or uniform, yet they serve as the foundation for successful vaccination. They were made on farms from scrapings of infected cow bellies, coarsely filtered, and mixed in glycerine. While today's vaccine product may be more meticulously manufactured, the CDC admits that the science behind even modern smallpox recommendations has been little more than a guess. And CDC has no idea what antibody titer is protective. They surmise that the vaccine provides high-level immunity for 3-5 years. 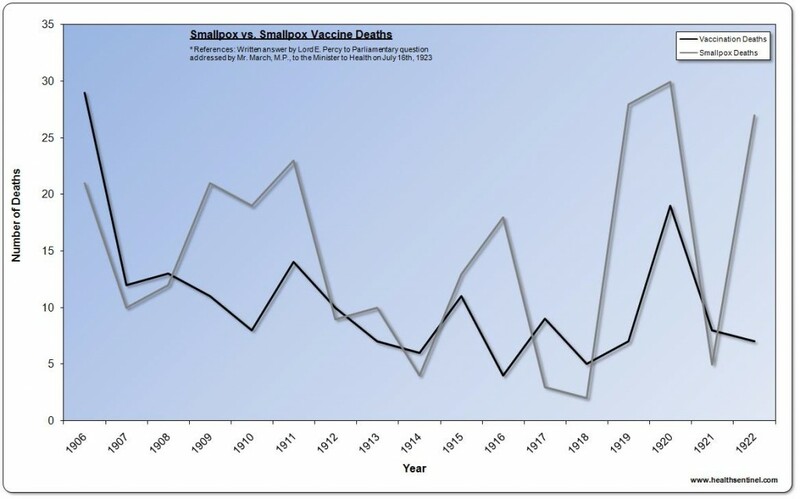 Here is a graph of smallpox vaccination deaths and smallpox disease deaths, from England spanning the years of 1906-1922. The vaccine-associated deaths are conspicuously high, at about half the rate of smallpox deaths. "It is a remarkable fact that Jenner's[the inventor of smallpox vaccine] first child, his eldest son, on whom he experimented, died subsequently of consumption[tuberculosis]. Another of his subjects, the man Phipps, whom Jenner vaccinated, also died of consumption." Those who were vaccinated for smallpox were noted to be more severely affected by smallpox and tuberculosis. Many were exposed to tuberculosis from tuberculous animals that were used to make vaccines. CLICK HERE TO LINK TO "SMALLPOX AND THE FIRST VACCINE" CHAPTER FROM OUR UPCOMING BOOK. Smallpox manifested in several different forms(ordinary, modified, malignant, hemorrhagic). Genetically the minor and major forms of variola are related and indistinguishable by PCR. Individual susceptibility, rather than the virus probably made the biggest difference. Susceptibility would have certainly increased after injection of filthy vaccines that contained myriad bacteria and viruses. What is most likely is that the appearance and disappearance of epidemics had much to do with the constitution and care of the population of the times. Scurvy was common in areas with hemorrhagic smallpox. This is no surprise to anyone who understands the full spectrum of ascorbic acid's function in the body, especially on blood vessels. Pox epidemics declined as a result of sanitation and improved nutrition. During the era of smallpox most people were living in squalor, eating no fresh food, but rotten milk and rotten meat, drinking sewer water, living among filthy rodents, and working long hours for little pay. Pox viruses are ancient, but smallpox evolved as a deadly killer as humanity devolved to overcrowded city dwellers living with filth, squalor, and desperation. Historical evidence points to the fact that the vaccinated were amongst the sickest in times of smallpox vaccines. Protests against the vaccinators and smallpox vaccination were massive. Parents commonly chose jail rather than permit their newborn babies to be vaccinated. Entire towns and districts revolted before the disease was finally declared eradicated, and the vaccine madness ended. Smallpox vaccination ended in the 1980s because smallpox had declined and because there was so much trouble with the old unsafe vaccine. That same trouble with the newer supposedly more safe smallpox vaccines is why smallpox vaccination ended after the 2003 first responder effort. Which makes you wonder just how much more trouble there was with the old smallpox vaccine which had a very long list of known bacterial and other "contaminants" because of its method of production. After the 2003 vaccines, reports of generalized vaccinia, autoinoculation, erythema multiforme, myopericarditis, ocular vaccinia, and postvaccinial encephalitis were reported. Smallpox was declared eradicated before clear distinctions between different poxviruses were made using DNA analysis. Symptoms alone are what were counted for smallpox during smallpox epidemics. Vaccination was a major source of smallpox outbreaks, and only a small portion of the earth's entire herd was ever even vaccinated. Considering all of this, how can anyone believe that smallpox was eradicated with a vaccine? With every vaccine suppressible disease, the general hysteria level usually depends on the availability of a vaccine. Once a vaccine was available, the disease was suddenly made out to be more problematic. Look how dangerous chicken pox became after the vaccine was developed. Pertussis is now hot news and the unvaccinated interrupting herd immunity is raised over and over, despite the science that shows the vaccinated are by far and away the most affected by whooping cough. This is the most recent, but not the first study to demonstrate 86% of cases of proven whooping cough are in the vaccinated. How can getting even 100% vaccination uptake create an immune herd with such vaccines? Mumps vaccine was known to be ineffective after two major outbreaks in vaccinated populations in the USA. Yet the solution was to double the boosters in children with a vaccine that is now ALLEGED by two former Merck scientists, to have been known to be ineffective by Merck's executives. Jenner's initial promise was "We have a vaccine that will protect you for life with one injection." But even he was revaccinating his patients yearly, within 5 years of making that statement. And when that doesn't pan out with whooping cough, measles, mumps and whatever, the authorities say,, "We have a highly effective vaccine if it is given on time with boosters," then "This is an excellent vaccine when 3 or 4 boosters are given, and adults are revaccinated." Or in the case of whooping cough, introducing an all-together new vaccine. There is a new nasal vaccine in the pipeline for newborns, which will be given alongside the already ineffective whooping cough vaccine series in childhood. This will no doubt be touted as a wonderful combination. Eradication target dates are constantly moved forward, and the unvaccinated or the vaccine refusers are blamed for all outbreaks. Or in the case of Pakistan, they are branded TERRORISTS orRELIGIOUS FANATICS for not wanting their children to have 30 oral polio vaccines by age 5. I have outlined in a PREVIOUS BLOG, just what is really going on in India and how her people are being terrorized by WHO and CDC as the rate of paralysis continues to skyrocket. I believe that when diseases disappear from sight, the disappearance is never solely by virtue of the vaccine. Yet the vaccine always gets the credit, because the blind faith in vaccines is prioritized over the scientific evidence. Evidence to the contrary of the value of vaccination is consistently snuffed out and kept away from the mainstream media, so that the herd never hears a peep of the truth. Instead, they get the "herd immunity" sound bite, which gives undeserved credit to the risk-benefit ratio of vaccination. Inside the web of half-truths and misinformation, the vaccine religion somehow justifies the public display of resentment and fear of the unvaccinated. A special thank you to "O" from "INSIDE VACCINES" for assistance in editing this document. 1. Hedrich AW. 1930. The corrected average attack rate of measles among city children. Am. J. Epidemiol. 11 (3): 576-600. 7. Papania M. et al. 1999. Increased susceptibility to measles in infants in the United States. Pediatrics. Nov;1045(5):e59 pp 1-6. PMID 19545585. 10. Kandapal SD. 2003. MEASLES ANTIBODY STATUS AMONGST NINE MONTHS FIVE YEARS UNVACCINATED CHILDREN. Indian J Prev Soc Med. Vol 34 (1) pp 8-16. 11. Langmuir A.1962 .The importance of measles as a health problem. AJPH vol 52 no 2 pp1-4. 14. Weinstein Robert. 2005. Reemergence of Monkeypox: Prevalence, Diagnostics, and Countermeasures. Clin Infect Dis. 41 (12): 1765-1771. 16. Human anti-mouse antibodies (HAMA) are a common cause of false positive ELIZA. A person can develop HAMA for different reasons. The clinical use of monoclonal mouse antibodies (e.g., for radioimaging, in the treatment of some cancers) often produces HAMA. HAMA may also arise because of incidental or occupational exposure to foreign proteins (e.g. veterinarians, farm workers, food preparers) or due to the presence of domestic animals in the home environment. Blood transfusion and dialysis are among other sources of heterophilic antibodies. 20. CDC Fact Sheet. Smallpox vaccine and monkeypox. http://www.cdc.gov/ncidod/monkeypox/smallpoxvaccine_mpox.htm. 23A. Lancet Review. Jan 2004. Monkeypox. vol 4. pp 21-25.